First of all, I'm going to go through a bit of last month. This is March's completed monthly spread, and I promise that it's not nearly as fluorescent as it seems to be in the picture. 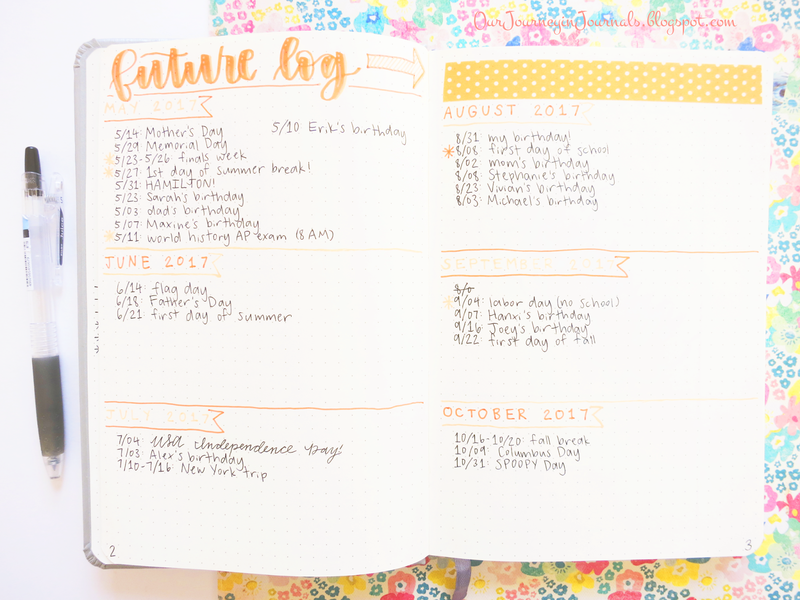 This was a spread I made in bujo vol. 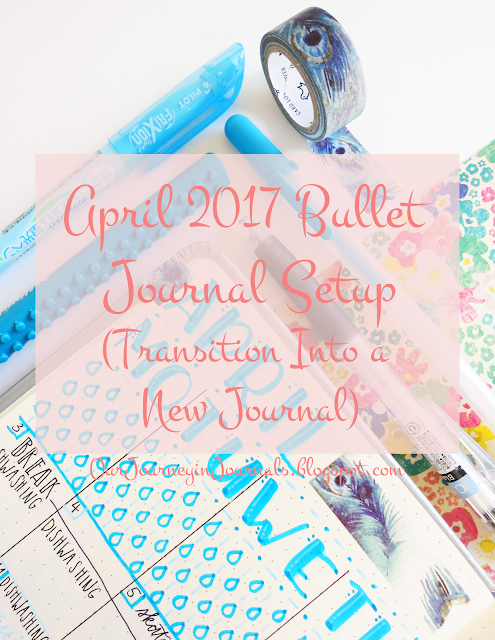 2 to help me transition into bullet journal number 3. I basically went through all of my collections and made a list of the ones that I wanted to keep. I then brainstormed about all of the changes I wanted to make or new things that I wanted to add into my new system. Once I recreated the old collection into the new journal (or at least started to set it up), I checked it off. As you can see, I haven't actually fully transitioned everything into my new bujo. And finally, this is the last page of my old bullet journal. 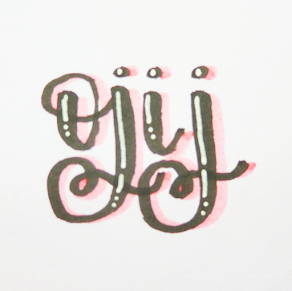 I originally did some brush calligraphy directly onto the page, but I absolutely hated how it looked. So instead, I just taped some pretty scrapbook paper on top and did faux calligraphy using a Sharpie. 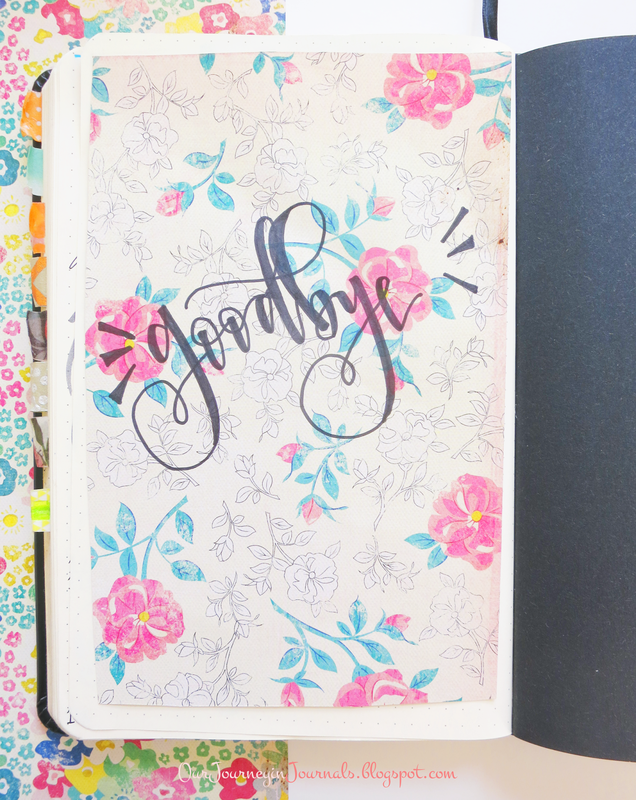 I lettered "goodbye" since I couldn't think of anything else to write, lol. 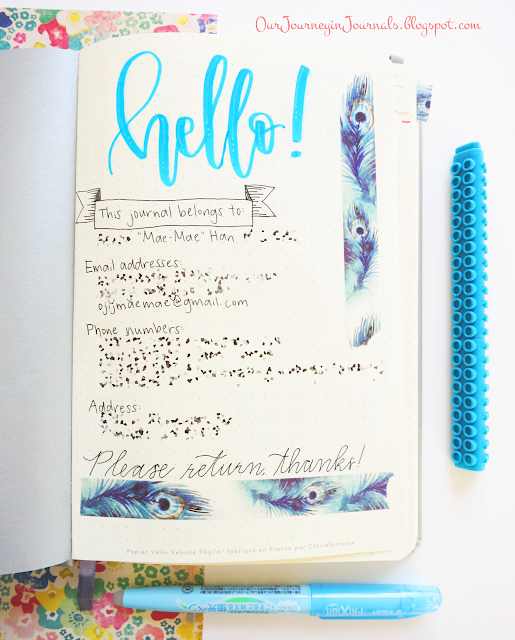 Finally, here is the beginning of my new bujo! I didn't take a picture of the journal's outside, but it has a gorgeous, brushed silver cover. Like my old bullet journal, it's a Rhodia A5 Webnotebook with dot grid pages from Goulet Pens. I don't actually have a set of house keys. I live in one of the safest places in the country with a very low crime rate. Having my address actually helped back in January when I lost my backpack, which had my bullet journal in it; one of the big reasons they got my stuff back to me was because I had my address written there (read this for more details about this interesting experience). So, with my third bullet journal, I decided to stick with a similar page with pretty much all of the same contact info. However, if you live in a shadier area, I highly dissuade putting as much personal information as I did. 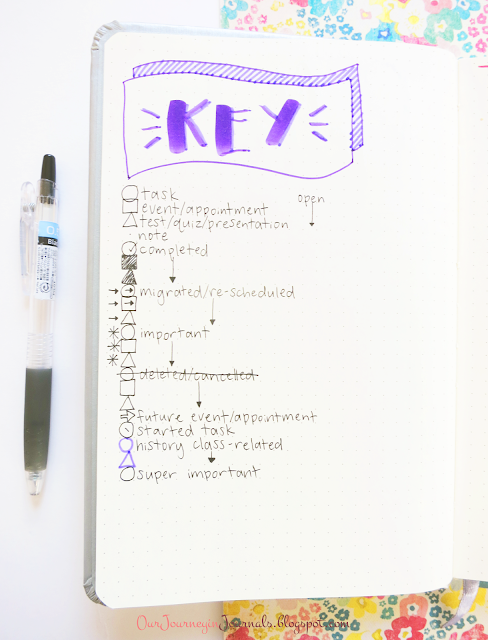 This is my updated bullet journal key. It's pretty much the exact same as it's been in the past year; the main difference is that I use color instead of black if it's related to my AP world history class, since that's the hardest course I'm taking right now, so I try to make its tasks and such a higher priority. 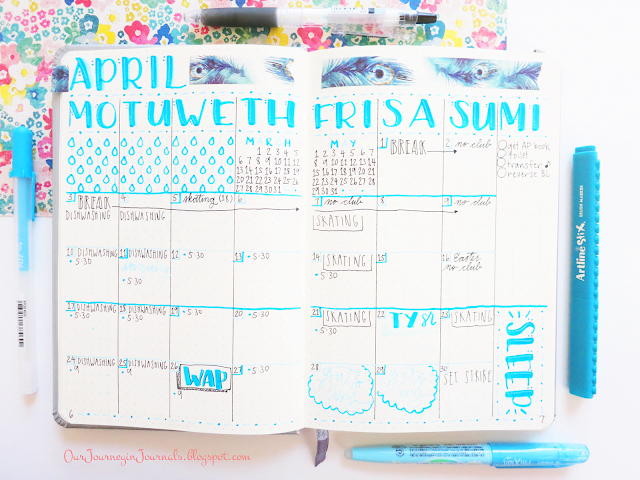 As I've done previously with each month, I indexed April using color to make it stand out more. Here is my new future log! It's pretty much standard to what a traditional one is like, and it spans six months as most do. 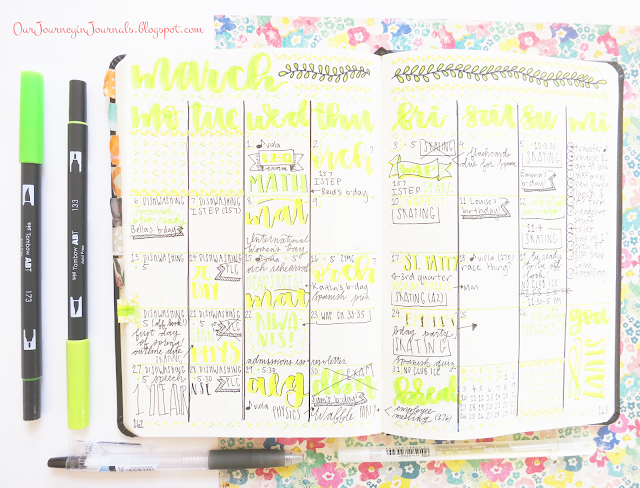 This is my April monthly spread so far! I went with a blue theme because of "April showers" and stuff like that. The main brush lettering is done with an Artline Stix brush marker, accents are done with a Sakura Souffle gel pen, and a Pilot FriXion Light Highlighter is used to make shadows on the letters. The only thing I've changed from last month is that the little goals section in the bottom right corner doesn't have a header. I use that area for any big goals that I want to focus on throughout the entire month; in April, for example, I want to try to sleep more since my sleeping habits have kind of gone to sh*t in the past couple of months. Also, the last column ("mi") stands for miscellaneous, and this is where I put any sort of random monthly tasks or notes that don't really belong anywhere else. 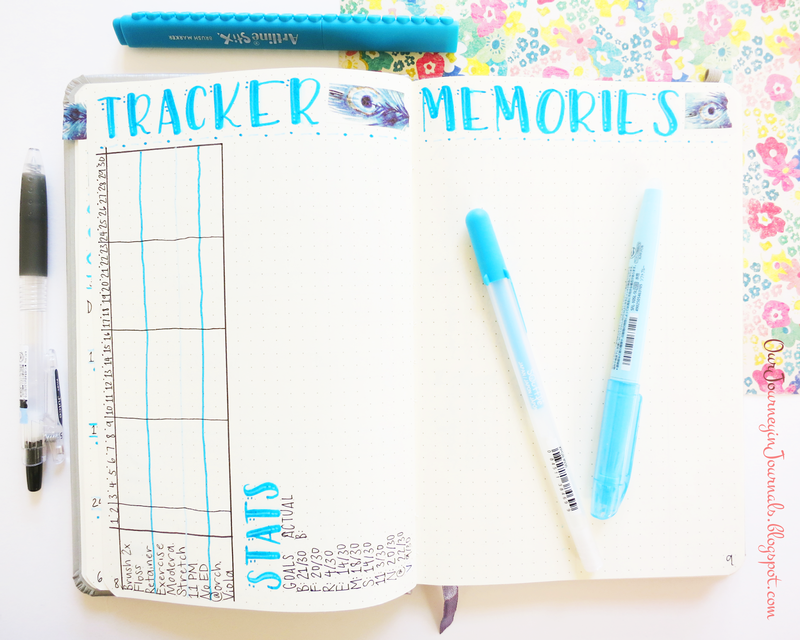 Here is my blank monthly habit tracker and memories spread! For the past couple of months, I've been using the "stats" part in my tracker to =analyze the data from my tracker and use it to encourage myself to do each habit more often. 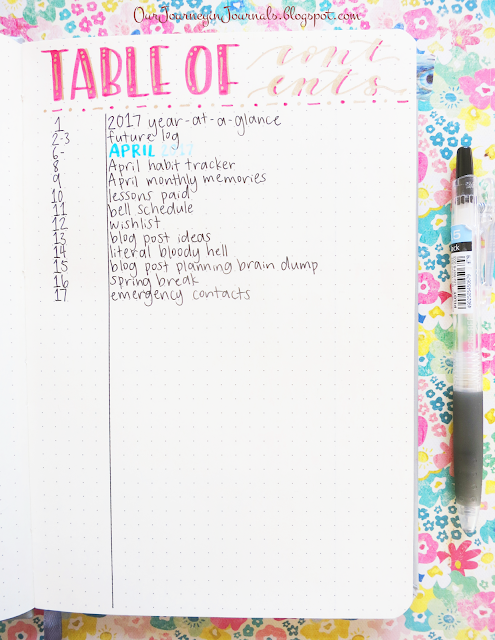 If you've read my monthly bujo setup posts before, then you know that I usually show my monthly memories spread from the previous month. However, I still haven't gotten around to finishing March's, so I can't show it yet. I still have a lot more spreads to put in, as you can see in that picture from earlier. So, that's what I've set up so far for April in my new bullet journal! 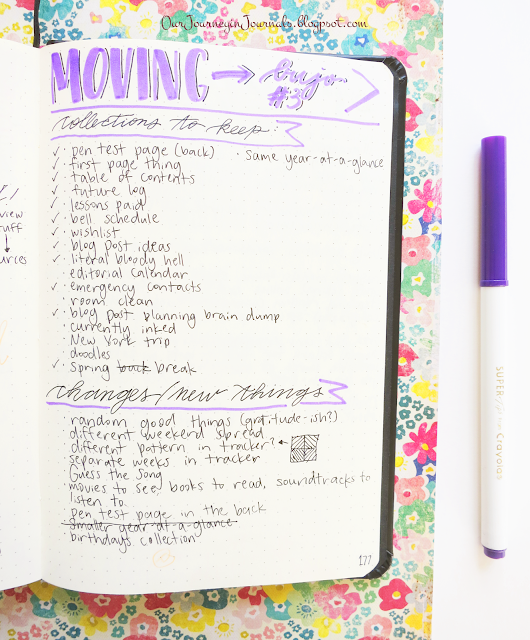 Next week, I'll be going through how my bujo system has changed in the past year since, like I said earlier, I've now been bullet journaling for an entire year, so watch out for that. How long have you been bullet journaling? Let me know in a comment! 3 weeks now, and I love it! I hope you stick with it!